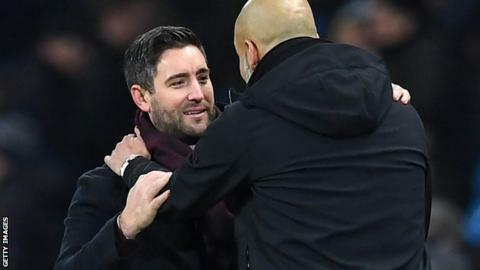 Promotion-chasing Bristol City feels like a "club on the rise" following their run to the Carabao Cup semi-finals, says head coach Lee Johnson. The Robins, who are fifth in the Championship with 18 league games remaining this term, have not played in England's top flight since 1980. After Tuesday's 3-2 second-leg loss to Manchester City, Johnson's side's focus will turn towards league matters. "We call ourselves a Premier League club in training," he told BBC Sport. "The club has come on leaps and bounds. Individuals have improved and the infrastructure has improved off the pitch. "We have got a lot of young players. We feel like we are still a club on the rise." The Robins' best League Cup run since 1989 was ended with a 5-3 aggregate defeat by the runaway Premier League leaders. However, their performances over the two legs still won widespread praise. "The fact is, it has taken them [Manchester City] two injury-time goals in both legs to beat us," Johnson added. "We gave it a go in the second half. We had them rattled for probably a five-10 minute period. "I'm very proud, not just of the team, but of the club. It was a fantastic run. "The players will learn an awful lot from that game, with the speed of thought, the touch, and the way they recycle the ball. Man City have got world-class individuals." December's dramatic win over Manchester United in the quarter-final was Bristol City's fifth in a row in all competitions. Since Boxing Day, they have failed to win in seven games, losing six, albeit with three of those coming against top-flight opposition and amid a lengthy injury list. "People will say we are in a bit of a dip of form but I don't see it that way," Johnson continued. "Individuals are playing well. "With a full tank of energy, we can go toe-to-toe with these teams [at the top of the Championship]. "Everybody is buzzing about the city and that doesn't end now. Yes, we are out of the cup, but we move in to a really exciting league campaign. "It's just a chapter in the season that's now closed and we want to write another good chapter for the run-in." Having been knocked out of the FA Cup by Watford, Bristol City host QPR in the Championship on Saturday. The Robins - who finished 12th in League One as recently as 2014 - are five points below second-placed Derby.